By Wyatt Hull, 12/15/2006 - Under a benign sounding program called “Pathfinder,” single-family houses in the United Kingdom are targets of the wrecking ball. The aggressive tactic of "public/private partner" redevelopment called “Smart Growth” (rails, trails and high-density housing) is occurring on both sides of the Atlantic. “Eminent domain” and “compulsory purchase order seizures” are on the rise but there is also hope in the form of successful individual resistance. By Carol Knapp and Valarie Stewart, 10/16/2006 - Private property advocates respond to Los Angeles Times’ missing coverage of the Hollywood & Vine eminent domain redevelopment controversy. By Orlean Koehle, 8/1/2006 - Property owners need to make a bold statement and a firm stand - no more encroachments on our rights and "taking" of our land - not 200 ft, not 100 ft, not 50 ft, not even one foot! By Ronald A. Zumbrun, 7/11/2006 - A true nightmare story of what can happen when you find yourself outside the political “inner circle.” A relative of a disgruntled employee told Hillary Falconer of Briarcliff Farm that she was going to report Falconer to the county and other agencies. Shortly thereafter, Briarcliff Farm was inspected by the enforcement unit of the Planning Department of the County of Santa Cruz. And thus, the nightmare began! By Lawrence Samuels, 4/26/2006 - When does a voting majority ever have the right to take away legal property from another? According to one of the most renowned U.S. Supreme Court Justices, Robert H. Jackson, the answer is never. According to Jackson, "One's right to life, liberty, and property, . . . and other fundamental rights may not be submitted to vote; they depend on the outcome of no election." 9/7/2005 - Despite what you might be hearing, the reauthorization of the Endangered Species Act (ESA) will not foster respect for private property rights. By Dan Byflield, 6/27/2005 - Smooth salesmen and lawyers representing land trusts, environmental organizations and government agencies are swooping down upon America’s beleaguered and highly regulated rural landowners. With a smile, some cash and a contract, America's landowners are rapidly losing private control of natural resources. "Liberty Garden proves that if people are free to create voluntary associations, the laws of economics and the consequence of stewardship will cause the earth to improve." 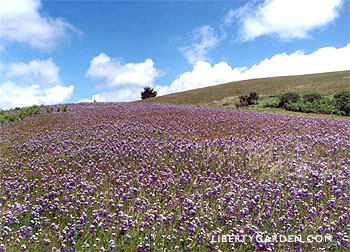 6/15/2004 - LA SELVA BEACH, Calif. -- Michael Shaw is the owner and proprietor of Liberty Garden, where -- using a program of seedbank management -- he created a native plant oasis o­n the central coast of California. In this excerpt from his treatise "What is Private Property? ", Shaw explains that if people are free to create voluntary associations, the laws of economics and the consequence of stewardship will cause the earth to improve. "Private property and a healthy planet are inseparable," Shaw says.